You can quickly create a specific list of leads or prospects for a mass email campaign in Fileboard through Salesforce. The quickest way to do this is by creating a custom view from your Leads, Accounts, Contacts or Opportunities in Salesforce, depending on who you might want to reach out to in an email campaign. To begin, visit the tab in Salesforce you want to pull records from. For this example, we'll use the Leads tab. In the above screenshot, you'll notice from the dropdown tab that you may already have a view you may want to use. If you need to create a custom view for a specific list in Fileboard, select Create New View. Now we'll build this new view. In Step 1, give your view a name as well as a specific, unique identifier name for Salesforce. For example, you may have two views named "Chicago Contacts", but each would need a unique Identifier to distinguish the views in Salesforce, such as "Chicago1" and "Chicago2". Here's where your view starts getting specific. 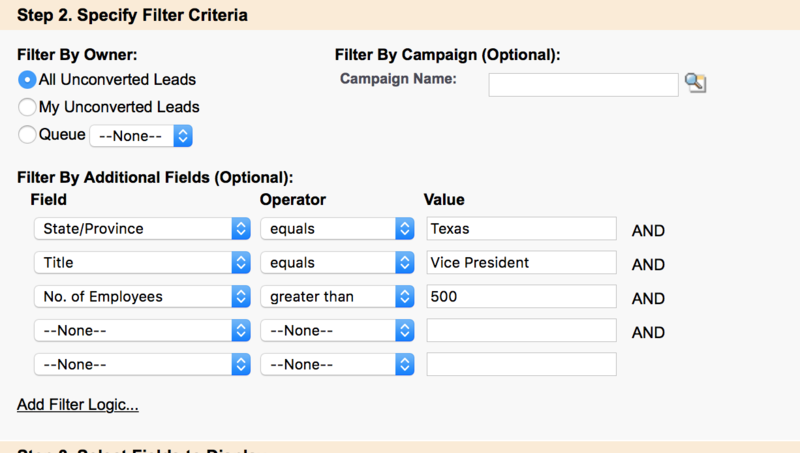 You can customize these fields based on certain parameters: in this example, we want this list to be populated by all unconverted leads across our whole team (You can specify just your leads, or just a certain team member's leads) and we'll also filter to only populate the view with Vice Presidents at Texas companies larger than 500 employees. Now, we have a targeted, very specific view of leads from these parameters. For Step 3, we'll choose which fields this view will display. When this view is synced to Fileboard, these fields will copy over, so it is handy to include as much detail as you want into Fileboard. 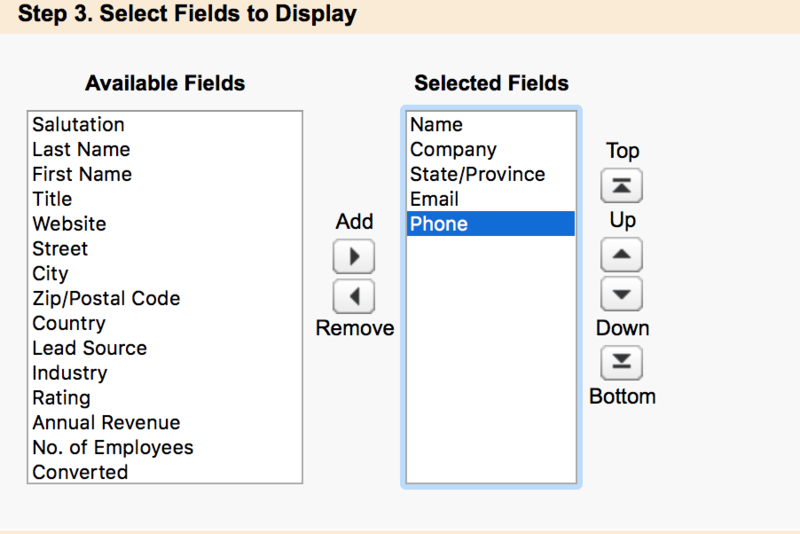 ATTENTION: While most fields are optional, either the Email or the Phone field MUST be included in the selected fields for a proper sync, Fileboard uses these unique identifiers when distinguishing between contacts. Finally, in Step 4, you can restrict visibility of this list to either yourself or certain parties in your Salesforce team. Once you've made this decision, click Save at the bottom of your screen. The new View has been created, so click on the Fileboard tab and click the More button, and then Lists. 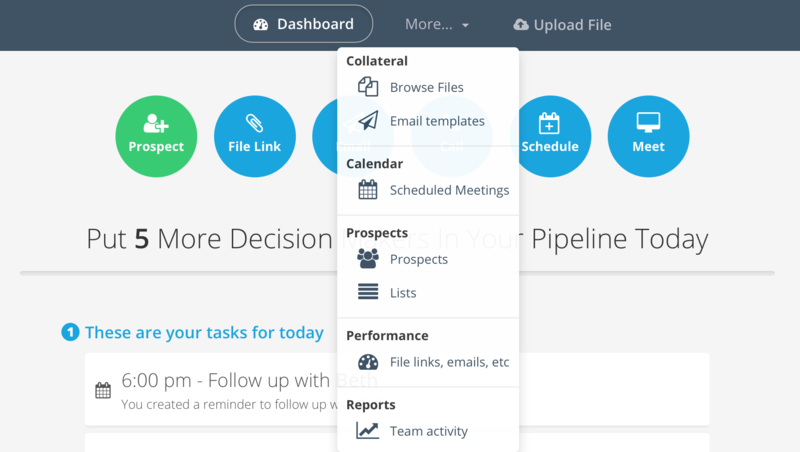 Next, choose a list to import your new view of leads into, or click the blue Create New List button. Be sure to select the correct record type before looking for your new view, whether it is Leads, Accounts, Contacts, or Opportunities. Next, look below for your specific view you just created, and click on that view. You can review the data here to ensure the view and records are correct, and click Finish Import to push the data to your new Fileboard list. Once your import has finished, you can begin a Mass Email campaign to reach out to your Salesforce prospects!